Quill Lessons are classroom activities designed to promote discussion and collaborative learning. Teachers lead students through a grammar concept with the help of our step-by-step teacher guide. As students interact with the lesson, teachers can see students submit answers in real time. Then, teachers can flag students or display their answers anonymously. 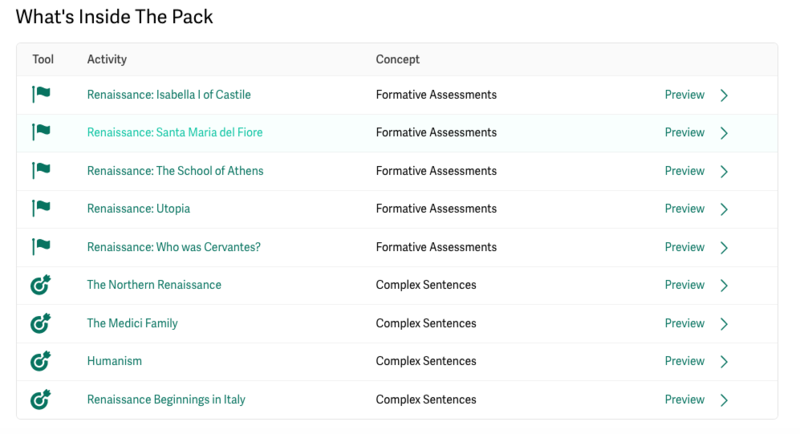 Teachers can customize content and model skills directly on the interactive slide. When the Lesson is over, Quill provides students with an optional follow-up practice activity. Look for the apple icon to find Lessons in our Activities! Teachers can now share classrooms through co-teaching. Co-teachers can manage classes, edit students, assign activities, lead lessons, and access reports. 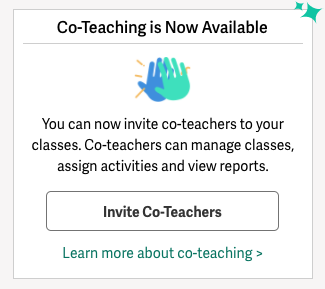 Invite co-teachers from the Class Overview page! Quill is always adding more content. Recently, new content packs focused on Socials Studies and Science topics have been added to Quill. Check out our content packs on Geology, the American Revolution, Chinese Dynasties, and the Renaissance!